Arranging the Dreamcast Sorting it out for good? 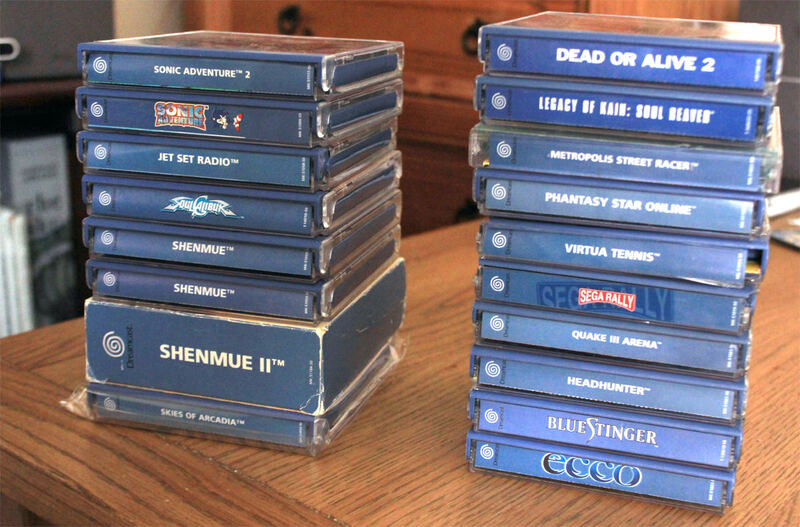 With the announcement of Shenmue HD big revisions are in need, I've always said Shenmue is the reason I have a Dreamcast, which is mostly true until I recently bought Skies of Arcadia! Beyond that though games like Sonice Adventure 1&2, Jet Set Radio & Crazy Taxi have been ported digitally to the PS3, So I am debating what to do with my Dreamcast Collection now. Left Side - Even though I'm getting a Shenmue Remaster, (I feel this way for Snoic and Jet Set too) keeping the originals are key to me. I do intend to play Skies of Arcadia. As for Soul Calibur, I don't have a better version of it elsewhere - I think there is a digital version on 360, but is that the full game? Either way its a physical Edition and a keeper. Right Side - I have Soul Reaver on PS1 & Dead or Alive 2 on PS2, so I have no need for them. I don't care for many for the other games - If I really want I can get HeadHunter, Crazy taxi & Quake III dirt cheap on PS2. So that's where I stand, I want to keep the console, but mine is rather worn - The console plays fine but its casing is yucky and yellow :/ So maybe I could sell a console bundle and get a fresher one, extra thought. There aren't any other Dreamcast games I'm after at all. But that's everything that comes to mind, just wanted to see what other peoples thoguhts on the sitation are, as i 'm still pondering. If you're torn you could always do something like keep the console exclusives and get rid of those you mentioned that you can get elsewhere.